All of my books are avail­able as paper­back and e-book through Ama­zon, but most are also avail­able in for­mats for the oth­er e-book read­ers. Time to pull it all togeth­er. Through books2read, it’s pos­si­ble to give one link for each book. (The Kin­dle link will also show the paper­back site.) Some mar­kets oth­er than Ama­zon also car­ry the paper­back issues. 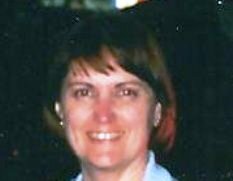 I’ll start with the Jo Durbin Series links. The Desert­er and Oth­er Sto­ries — Ten short sto­ries, includes recipes. Avail­able in paper­back and all email for­mats. This ebook is a free pre­mi­um for mem­bers of Norma’s Chat. Once a month or so, I send a vari­ety of pub­lish­ing news, links to free mys­ter­ies, maybe a recipe, a review, or news of mys­ter­ies on sale. Go to the Free Book site for more infor­ma­tion, or straight to the Book Fun­nel link here. I enjoyed this book tremen­dous­ly. Rather sur­prised me— It’s in 14-year-old Charlie’s view­point (and I’m a great-grand­ma). Grandma’s real­ly should say some­thing like this is scandalous—a child dri­ving a car half-way across the coun­try, aid­ed and abet­ted by his grand­fa­ther who is seri­ous­ly ill, dodg­ing the police and evad­ing his par­ents. But that’s not what I want to say. I say, “Go for it!” (Just don’t let MY grand­son try this 😉 ) It’s thought­ful, sur­pris­ing, and sounds just right. This book is from Edgar Award-nom­i­nat­ed author Ben Rehder. The aver­age read­ers review is 4.6. Most think it quite won­der­ful. It’s hilar­i­ous with a quite seri­ous under­tone, I guess you might say. One review gave it a good score for the writ­ing, but didn’t agree with the view­point. Since this is rec­om­mend­ed for ages 13 to adult, it might be on your list for hol­i­day giv­ing. Ama­zon list­ing here. I’m twit­ter­ing memes, even though I’m not sure memes is the word I want. Accord­ing to the dic­tio­nary a meme (meem) is “an idea, behav­ior, or style that spreads from per­son to per­son with­in a cul­ture”. So, I can only hope my memes will fit that descrip­tion. This is the first time my five-star review has revis­it­ed any author. You see, I like to toot the horn for as many authors as pos­si­ble, often talk­ing about the first in a series. But this book is a stand-alone, and in an entire­ly dif­fer­ent cat­e­go­ry. For a dif­fer­ent age, as well. Mid­dle-grade to young adult ver­sus adult mys­tery. Here’s the Ama­zon blurb: “A ten-year-old’s new home on an exot­ic Caribbean island proves so fas­ci­nat­ing she quick­ly for­gets she didn’t want to leave Texas. After all, where bet­ter than a jun­gle world teem­ing with voodoo, mys­tery, and a real­ly pesky zom­bie, to indulge her favorite pas­time: snoop­ing. 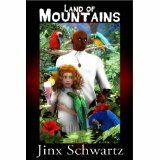 One review­er says: LAND OF MOUNTAINS by Jinx Schwartz is a Young Adult book for read­ers from 8 to 108. 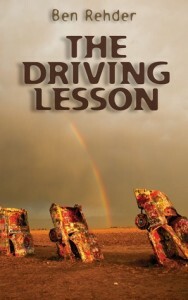 The book is a final­ist for a 2012 Eppie award. Land of Moun­tains is sold as an ebook and paper­back (with either cov­er) at Ama­zon link. If a ghost from the past want­ed to com­mu­ni­cate through a series of hand­writ­ten notes, would a teenag­er today be able to read them? This was the orig­i­nal premise of my soon-to-be-released YA novel­la Pass­ing Notes. A cou­ple years ago my 17-year-old daugh­ter was in a rela­tion­ship where I swear the only way she and her boyfriend com­mu­ni­cat­ed was through texts – end­less amounts of non­sen­si­cal (and in my opin­ion, not very roman­tic) texts. I’m pret­ty sure they nev­er actu­al­ly talked to each oth­er. At the same time, my younger daugh­ter, who was nine, was learn­ing to write cur­sive. She was in the rare 3rd grade class­room that still taught cur­sive writ­ing, as most ele­men­tary schools have pulled that cur­ricu­lum, edu­ca­tors claim­ing it to be unnec­es­sary. Between the two expe­ri­ences of my chil­dren, I came up with a sto­ry idea: a boy is try­ing to win the love of a girl but is fail­ing because he keeps send­ing awk­ward and stu­pid texts or emails. Sud­den­ly, he begins get­ting a series of hand­writ­ten notes giv­ing him advice about how to write love let­ters and win the affec­tions of this girl. He first has to learn how to decode these mys­te­ri­ous notes, and then he tries to fig­ure out who is send­ing them and why. I orig­i­nal­ly wrote Pass­ing Notes as a short sto­ry, but ear­li­er this year I felt inspired to take anoth­er look at it and stretch it out to a novel­la. Revi­sion is my mantra, and I am a big pro­po­nent of nev­er throw­ing away a sto­ry idea, because you nev­er know when the muse will vis­it with the per­fect solu­tion to “fix” what might be going wrong. In this case, my muse told me the sto­ry just need­ed more to it. I want­ed to real­ly explore who Mark’s girl Bethany was. Why would actu­al love let­ters appeal to her more than the ordi­nary texts and emails that every­one else gets? I intro­duced the rival boy at school, and added a cou­ple of Bethany’s girl­friends who aren’t par­tic­u­lar­ly on Mark’s side either. Most impor­tant­ly, I want­ed to build the rela­tion­ship between Mark and the ghost. How are the two of them relat­ed, and why does it mat­ter to the ghost so much that Mark win Bethany’s affec­tions? And then, of course, if he fol­lows the ghost’s advice, will it work? I was thrilled that Fire and Ice, the pub­lish­ers of my mer­maid nov­el Cry of the Sea, agreed to pub­lish Pass­ing Notes. It will be released on Jan­u­ary 24th, 2015. In the mean­time, do check out my cur­rent nov­el about a girl who dis­cov­ers real mer­maids washed up on the beach dur­ing an oil spill. You can sam­ple the first two chap­ters at the publisher’s web site: www.fireandiceya.com/authors/dgdriver/crysea.html Fol­low me on FB or Twit­ter to keep up to date on the release news for Pass­ing Notes, and read some of my oth­er sto­ries for free on Wattpad. 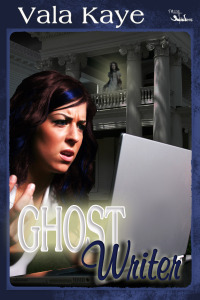 A ghost writer is com­ing. No, not the kind who writes sto­ries for oth­ers to claim. No such thing. We’re talk­ing real ghosts here, like dead peo­ple from the past. 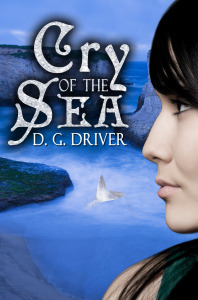 She has a great sto­ry to tell, both her own and the YA fic­tion about a ghost from the past. Ama­zon has a new pro­gram, pre-orders on e-books for self-pub­lished authors. I couldn’t miss that with my new book. So Cher­ish is list­ed here. The e-book will be avail­able on Sep­tem­ber 10. The paper­back page will appear (and be on sale) Sep­tem­ber 1, 2014. Here’s the blurb: It’s the sopho­more Local His­to­ry ceme­tery vis­it. 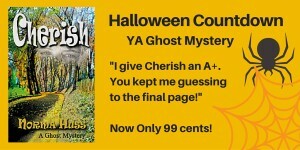 Sure, it’s almost Hal­loween, but Kay­la has seen that ghost for years. She wants to make the ghost go away, but she shouldn’t have touched her hand, because, That’s When Every­thing Changed. 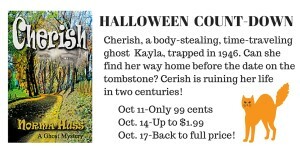 Kay­la finds her­self in 1946 as some­one else, some­one whose name is on an elab­o­rate tomb­stone. Is she Cher­ish, or is Cher­ish her? 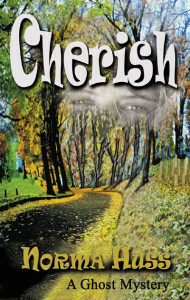 Is Cher­ish tak­ing her place? Fact: Cher­ish is ruin­ing her life in two cen­turies. 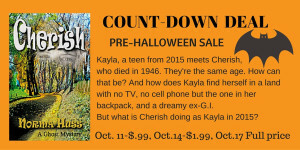 If Kay­la doesn’t find her way home to her own time and her own body, she will die with Cher­ish in a few days. Ques­tion: Do cell phone texts span the cen­turies? And, if they do, will Kayla’s friends believe her?